Whether you’re choosing to host your wedding abroad, you’re a pair of jet-setters who are rarely on terra firma or there’s one place you’ve always wanted to visit, share your dream with your wedding guests with this beautifully unique and rustic-yet-elegant invitation from Norma & Dorothy. The Bride’s, Groom’s and recipient’s names are all printed onto the translucent top sheet, which provides a wonderful sneaky-peek into what’s yet to come! Behind this, your map of choice is captured within a romantic heart shape that is without doubt the focal centrepiece of this chic invitation, surrounded by a delightfully rustic lace and spotted pattern that adds to the fun and excitement. 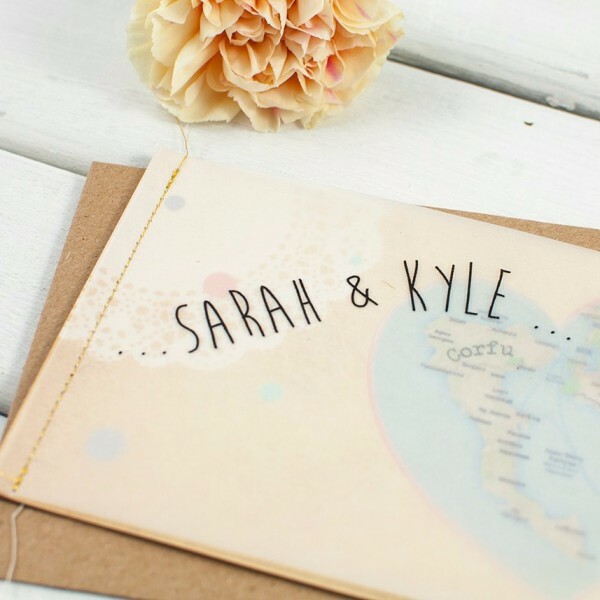 Your wedding day details are all printed on the final page, a Kraft base card which gives the Vintage Map Stitched Booklet invitation a feeling of rigidity, structure and luxury. The entire invitation is (as the name suggests!) stitched together on one side to give a real hand-finished and bespoke one-of-a-kind feel. The wording and colours are all completely customisable to ensure your invitation perfectly matches your wedding day celebrations, whether you’re planning to say “I do” in a flower-filled meadow, the beach or even a country manor house! If you’re looking for that truly crisp and consistent look, you can even opt to have your guests’ addresses printed on the envelopes, your address printed on the RSVP envelopes and even an extra page of further information, should you need to provide directions, contact details or colour schemes/dress codes! Tags: Abroad, Bespoke, Map, Travel, Vintage Travel.